For many, South Africa is synonymous with, amongst other things, the idea of safari; with wandering wildlife that is exotic, powerful and majestic. The Eastern Cape Province is living proof that this assumption is well-founded. With a smattering of national parks and reserves, along with wild coastlines and bountiful waters, there is an abundance of natural beauty here. And there are many different ways to see it – not necessarily from the confines of a safari vehicle. Trek, hike, ride and dive your way around the Eastern Cape’s magnificent sites – here’s how to do just that. It’s a robust journey, but hiking the Transkei Coast is one of the best ways to see and feel South Africa. 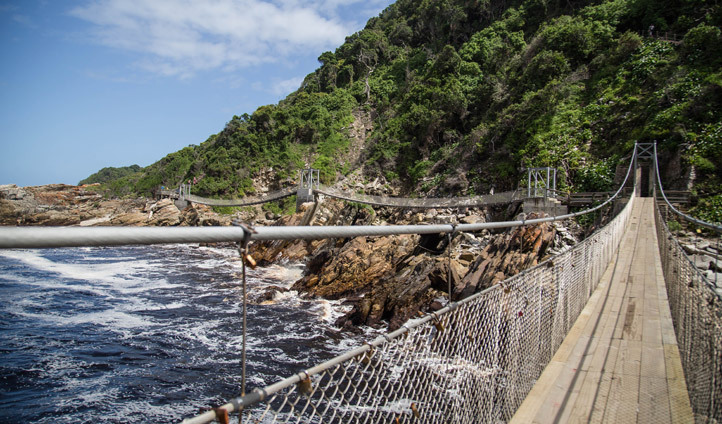 Not only does it provide trekkers with the chance to witness the raw coastline of South Africa, but it also allows for immersion into local culture and provides an education in the traditions and language of the Xhosa people. Over five nights, you’ll wander along jagged coastline as whales and dolphins glide through the waters below and you’ll visit rural villages, taste Xhosa food, and become accustomed to their daily lives and routines. This is a mesmerising stroll in which adventure, exploration and cultural immersion are fused together. 40 minutes from Port Elizabeth, in the heart of a coastal valley Bushveld, Hopewell Lodge is an impressive example of luxury that merges seamlessly into the surrounding South African wilderness. This eco-lodge allows guests to connect with the majestic South African nature at their own pace whilst traversing the 6600-acre estate. The safari experience at Hopewell Lodge offers travelers the chance to get up close to elusive cheetahs, observe herds of magisterial elephants, hippos, gazelles and more. This is a must for nature-lovers and those looking to experience unspoilt nature without completely discarding comfort. There’s plenty of opportunity to get up close to South Africa’s marine life as well, though diving into a bait ball is certainly one for the brave. Travelling to South Africa between June and July will provide vacationers with the opportunity to witness the ‘Sardine Run’ up close and personal. As millions of sardines migrate to the north, they are followed by dozens of predators, bigger fish and diving birds. Plunge into South Africa’s depths and witness this mesmerising natural act; you’ll be mere meters from dolphins, sharks, thousands of flitting sardines and possibly even a whale or two. Surely the ultimate diving experience? Eastern Cape is a province that’s home to some of the best restaurants in South Africa. Though we could recommend one, it’s better to sample a variety of eateries and a variety of flavors to truly get a taste for South Africa’s ‘rainbow cuisine’. Hazel’s Organic Restaurant in Addo is a well-kept, off-the-beaten-track secret; a must for those looking to enjoy hearty home-cooking and authentic African cuisine. Sampling some of the freshest seafood is also a good bet however and the Kitchen Windows Beach Restaurant, with its ocean-side setting, is the perfect place to visit. Plating up some of the freshest seafood plucked straight from the Indian Ocean and sourcing other dishes from organic farmers, this restaurant is a lesson in ‘made-upon-order’ dining.